The price of a gallon of gas was over 10-cents more in Lincoln than it was in Omaha and other surrounding areas on Saturday. Just sayin'. Husker Vision was pretty much the same as it was last fall, with the added footage of Pelini coaching in the 2003 Alamo Bowl, which got the biggest response from the crowd. The radio announcers were making way too big of a deal about the coaches being out on the field during some of the action. But mostly they were looking for anything to talk about. In fact, the network left the football action early to go to the Husker Baseball game. You know, because that was an actual GAME that meant something. Mike Ekeler has already been nicknamed "Captain Red Bull". He'll be a media darling as long as he's with Nebraska. Kevin Cosgrove was liquored up at Harry's Wonder Bar, complaining about getting suckered into betting the "overs" for the Spring Game. Everyone is trying to get a read on what the team's going to be like based on what happened on April 19th, which is just silly. There was a lot of stock into how great Joe Dailey looked in the 2004 Spring Practice. The reality is Saturday was a massive party for the House of Husker, which hadn't had any fun since the beginning of the USC game last September. In fact, many businesses pointed to that game as being the last time anyone could remember a level of excitement around the program. Yes, Saturday was a way to napalm the ups and downs of the past four years. 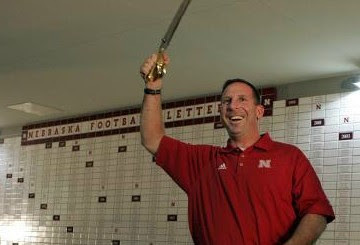 Just use photo shop and crop out everything from the end of Pelini's Alamo Bowl through Billy C's last stand in Boulder.